Fione Tan, president & CEO, eOneNet.com Sdn Bhd, the home-grown Internet marketing specialist, has proven that local internet talent is as good as, if not better than, the top internet marketing experts in the world. The latest Internet marketing coaching seminar conducted by eOneNet.com (www.eonenet.com) is now ranked No.1 Internet Marketing seminar workshop in top search engines, out of some 137,000 international competitive listings, claimed Fione. This seminar "Internet Success System - 10- Step System To Start And Turn Any Internet Business Into A Cash And Profits Generator", reveals a step by step system for entrepreneurs and business owners to follow in order to make money online. "Developing a website is just one of the 10 steps to make an Internet business work. The reason why most of the dotcoms failed is because they executed just one of the 10 steps by developing a website, and then did nothing else hoping that sales would just arrive," said Fione. "Whether a dotcom or a traditional business going online, these 10 steps are exactly what they need to follow if they want to make money on the Internet," Fione continued. The 10 steps include finding a product that can sell online, determining the profitable business model, identifying an easily targeted niche market, getting a good domain name, creating unique selling proposition for the product and compelling copy writing for the website, among others, according to Fione. "This seminar is an eye-opener. Although my website deals with networking of people which requires face-to-face interaction, I learned the exact steps to make my website generate more leads from all around Malaysia as well as from overseas," said one of the seminar participants, Avryl Au, national director of BNIMalaysia.com. "We can have many excuses for failure such as bad economy or bursting of dotcom bubbles, but there is only one recipe for quick success - to learn from those who are successful," said Fione. "I am computer illiterate but I got out of the seminar understanding how to make money on the Internet and now I am considering to start an Internet business," said a participant Madam Wong who is in her 60s. 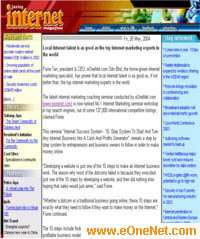 "Internet Marketing Experts - Jaring Internet Magazine"